Registered in Malta, Genesis Mobile Casino is a European online Casino with licenses from gambling authorities in both Malta and the UK. Despite its far away location, the casino is proving to be incredibly popular among South African players. For a casino that has been in business for barely a year (it was launched in 2018), this is a very remarkable feat indeed. But it is all rooted in some excellent business decisions, which focus on serving the needs of the consumer. 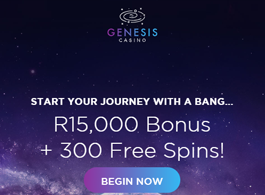 Genesis Casino has all the features a South African player would want: a good selection of casino games and slots, support for local currency (SA Rands), dedicated customer care portal, and a platform that can be accessed from mobiles as well as PCs. It is as simple as that! . Usually, casinos depend on a platform developed by a single gaming company. But that would somewhat restrict the number of games the casino can provide to its clients. So Genesis decided to do things differently, partnering with not one or two, but seven different gaming companies! And the results are impressive indeed, as the casino has over a thousand games to offer its lucky patrons. The platform used by Genesis is very stable, robust, and above all, flexible. Old fashioned online casinos use outdated technologies like downloaded client software to provide their gaming services to users. This is a very cumbersome process. You don't have to deal with any of that at Genesis Casino. This is a sleek modern casino that works entirely on a web browser platform. If a browser can handle HTML5 technology (hint: all browsers these days can), then you will be able to run Genesis casino on your device. You will not find any difference in performance between PC and mobile devices either. Old casinos sometimes offer a very limited games catalogue for mobile players. There is none of that nonsense here. What you get on PC/Mac is what you get on the mobile version as well. Whether you are on PC or mobile, you can start gaming by visiting the Casino website and logging in using your account name and password. It is as simple as that. Online safety is of great importance in these days when cybercriminals are everywhere. And when you have a website dealing with sensitive financial transactions, it is even more important to have the best security features available. And Genesis Casino has exactly that, with robust 128-bit encryption and strong SSL security on all its online portals. They only partner with the best banking and e-payment solution providers in the market to ensure that your money stays safe and secure at Genesis casino. The games library at Genesis Mobile Casino is filled with all sorts of casino games. It is estimated that there are more than a thousand games (closer to 1300) at the casino! The majority of these are in the Video Slots section. And the amazing thing is that all these games can be played on your mobile without any hiccoughs. Besides slots, the casino also offers authentic live dealer games like Baccarat, roulette and blackjack to its patrons. These lobbies are powered by NetEnt and Evolution Gaming. The game lobbies are available in various languages like French, German, and Swedish. Other options include non-live casino games at the Table Games section. Here again, you will find numerous variants of baccarat, blackjack, roulette, and poker, but this time without a live dealer. If you like less popular games of chance like Keno and Scratch Cards, Genesis Casino has a few samples of these games as well. You can find those in the “Other Games” section of the games library. Progressive slots are a very attractive option found at Genesis Casino. These are jackpots with prizes going as high as R150 million at times. All it needs it one lucky click to change your life! Popular games include Mega Moolah and Gunslinger. Since they are open to all players we highly recommend that you give these games a try every now and then. Genesis Casino was designed with the modern gaming crowd in mind. This casino has a strong mobile presence. All its parts are optimized to function smoothly on a smaller screen with touch controls. If you have an Android or iOS device with the internet, you are good to go. Since it is based on internet browsers, the casino should work equally well on less popular software environments like Blackberry and Windows Phone OS. The beginner’s bonus at Genesis Casino is called a Welcome Offer. With it, you get a maximum of R15,000 when you start depositing cash in SA Rands. For each of your first four deposits, the casino offers matching bonuses with decreasing percentages. For deposit 1, you get a 100% matching bonus (max R1500), while for the second one you get a 50% bonus. It goes down to 25% for the third and fourth bonuses. But for the last three bonuses, the ceiling is raised to R4500, which is how you get the R 15,000 (1,500+4500+4500+4500). You also get 300 Free Spins which can be used on a slots game specified by Genesis. The bonuses and promotions continue unabated when you become a regular client at Genesis Casino. You will constantly win matching bonuses, free spins, and other cool prizes at the casino. All bonuses at the casino have a wagering requirement of 40x. You will be spoilt for choice as far as banking option at Genesis Mobile Casino is concerned. Besides SA Bank transfers, the casino also offers you payment options like Skrill, Neteller, VISA, MasterCard, EcoPayz and EasyEFT. While all deposits are processed instantly, the withdrawals are a bit different. Some options like bank transfer may take up to a week. Online options like e-wallets result in a quicker withdrawal experience. Genesis Casino has three different channels for customers to reach the company. This includes a Live Chat feature that is available 24x7, an email address, as well as a dedicated toll-free number for South Africa players. Genesis Mobile Casino is an excellent choice for mobile gamers due to its browser-based system. The interface has one of the best designs we have ever seen. And it is also clear that the casino cares about its South African customers. Why else would they accept payments in ZAR and offer a dedicated SA toll-free phone number? The presence of hundreds of vibrant games from the best publishers in the business is just the icing on the cake.